Our pantry is DONE. It only took us, oh, a year, to finish this not-so-difficult project. Don’t let our procrastination dissuade you from attempting something similar. 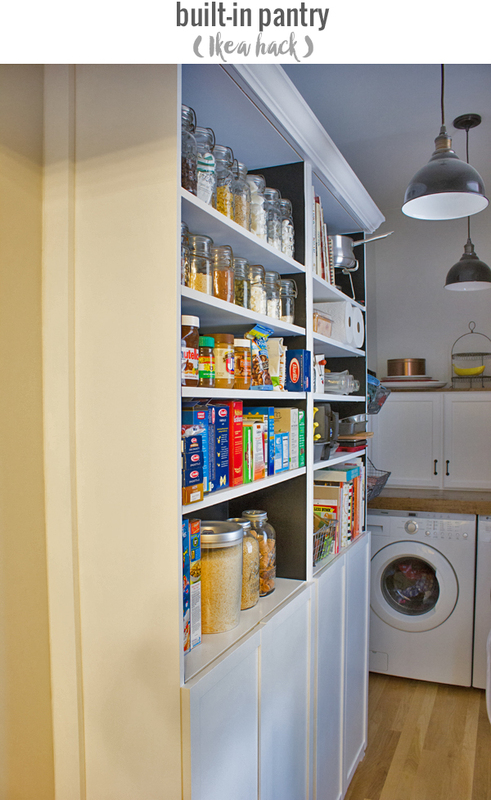 No matter how long it took to actually get off our bums and finish, we’re so happy with how our pantry turned out! So that’s where we were when we last updated you. Once we had all of the trim attached, the only thing left to do was paint the cabinets and make them pretty … aka, the best part! 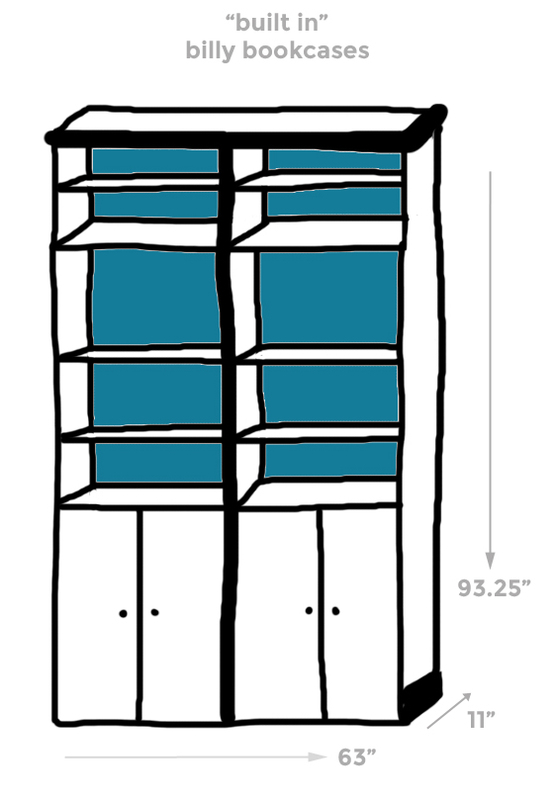 … or maybe the worst, as anyone knows who has ever thought about painting Ikea furniture. Here’s the thing: Ikea furniture is laminate. A lot of people will tell you laminate furniture cannot be painted. Not true! It just takes some extra steps and some special materials. So they say. This was actually our first time painting Ikea furniture, so I don’t want to pretend like we’re some sort of huge experts. We’re not. We did a ton of research beforehand, though, so we can at least pass that knowledge on to you. And we can tell you what we did that was so so wrong. Sand your entire surface. You aren’t trying to sand all the laminate off, but just give the entire surface a real light sanding so that your primer will have something to grab onto. Laminate is, by design, a super ultra-smooth surface, so if you don’t sand it a little, your paint/primer is going to essentially slide right off. Use shellac-based primer before painting. Shellac-based primer is the only kind that sticks to laminate. Zinsser primers are our personal favorite. Forget to sand. We just plain forgot to do this, and that was a big mistake. Like, an almost-worth-starting-over-from-scratch mistake. But so far we only are having minor paint peeling issues around the cereal boxes that get moved everyday. 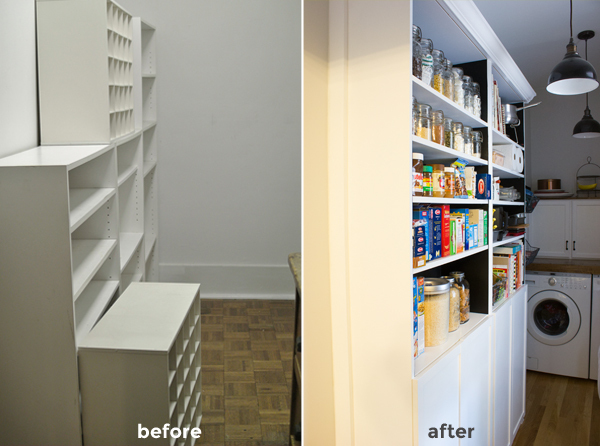 We painted the whole cabinet with Valspar Ultra White satin finish, which matches our kitchen cabinets nearly perfectly. It’s the same color we also painted our kitchen island. The trim and molding we painted in Behr’s white semi-gloss to match the rest of the trim in the pantry/kitchen. Despite our mistakes, the paint looks really good and eliminated that “Ikea off-white” color that drives me nuts and makes everything look so obviously Ikea. After finishing all the painting and then having to fix our peely paint mistakes, we added black contact paper to the backs of the shelves. I’d been debating for months what to do with the backs — paint them a bright color? wallpaper in a fun pattern? leave them plain white? But ultimately I decided on black contact paper. I thought it would be nice to bring elements of our kitchen into the pantry — like the black chalkboard wall we have in our kitchen and our black soapstone countertops. Plus I love how the contrast with the white makes the shelves really pop and stand out. This used to be a dysfunctional, disorganized room with a different (really bad) floor and really bad fluorescent lighting overhead. The whole space felt like an afterthought. It had been treated like a utility space, almost like a garage, instead of a really awesome feature of the house that could potentially add value and make the kitchen feel bigger. There was no cohesion with the kitchen or the rest of the house. But now it feels intentional, designed, like there’s a place for everything, and like it flows directly from the kitchen. 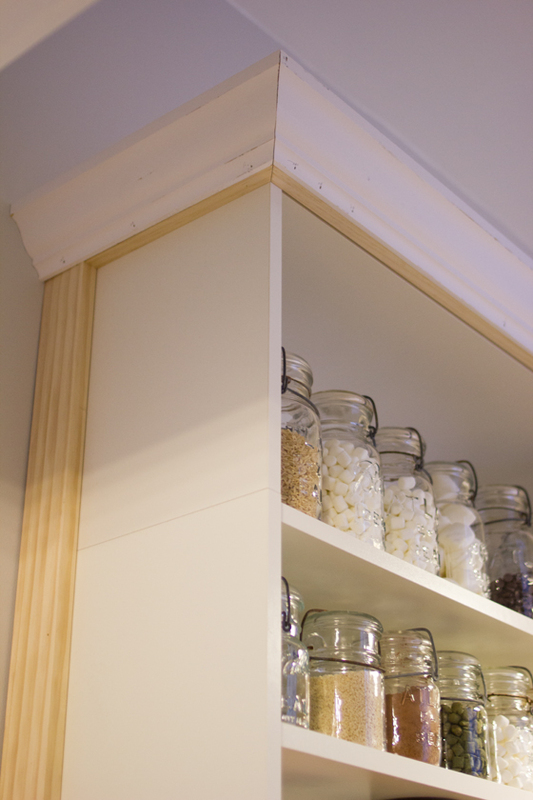 The pantry now has exactly the look we were going for — an extension of our kitchen. 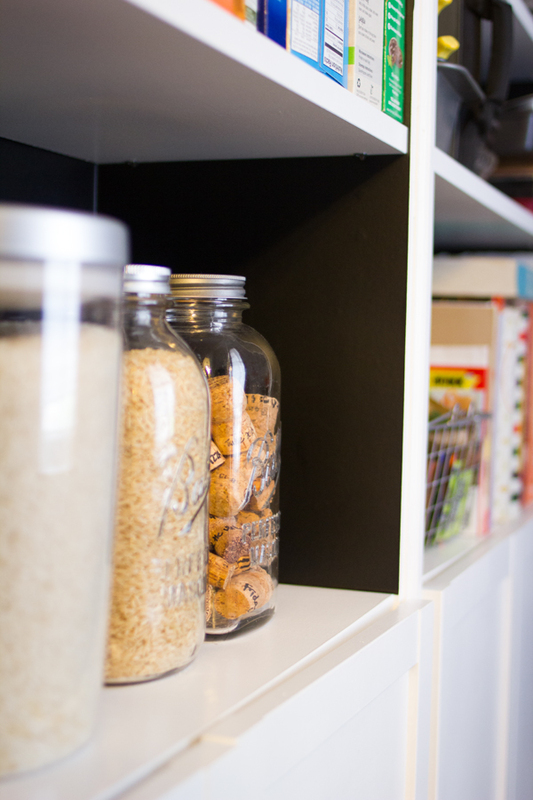 The Billy bookcases provide a ton of open storage for food, cookbooks, paper towels, and things we want to see at a glance. 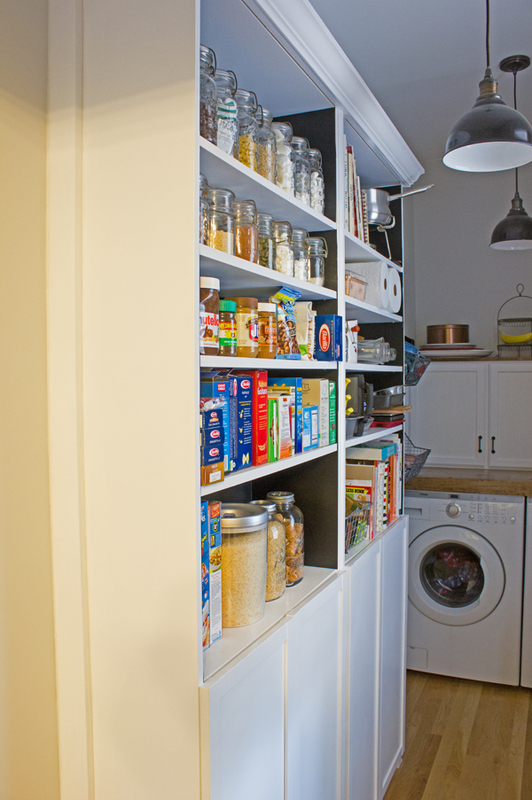 The bottom shelves are a perfect place to hide away unsightly small appliances behind closed doors. 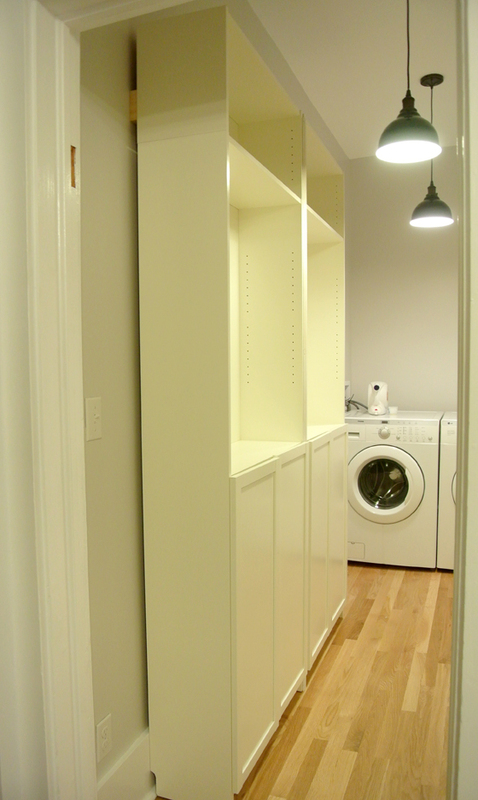 We love how the whole room turned out, from the built-in pantry area, to the laundry storage we built, to the mini mudroom on the right side of the room.